Kuriyma - WST Heavy Duty PVC Suction/Discharge Hose 6 in. X 100 ft. OD 7.17 in. • Heavy duty suction and discharge. • Clear flexible PVC construction with synthetic reinforcement - ideal for both suction and discharge applications ... allows visual confirmation that material is flowing. 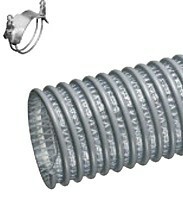 • Gray exposed PVC helix design - provides excellent strength characteristics while permitting hose to slide easily.